Welcome to my electronic portfolio. Whatever your native language, Welcome to my ePortfolio. My name is Dr. Linda Ralston. I am an Associate Professor at the University of Utah in the Department of Parks, Recreation and Tourism. This website has been designed to inform students, faculty, and staff regarding my professional accomplishments, both in and out of the classroom. Fostering a Sense of Learning Community an online workshop on Canvas Instructure. You will be required to create a free account but the bonus is you will have access to a wealth of information on the Canvas Commons network. 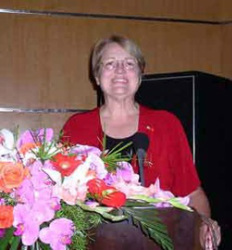 International Conference on Online Learning Presentation by Linda S. Ralston, Ph.D.